Members of faith communities locally in Washington and across the country have rallied around Washington National Cathedral in its time of need following last week's magnitude-5.8 earthquake. In the first gesture of a faith community's financial support, Cardinal Donald Wuerl sent a check for $25,000 on behalf of the Roman Catholic Archdiocese of Washington to help toward the costs of repair work, according to a press release. Washington National Cathedral, the sixth-largest cathedral in the world and the second-largest such church in the United States, sustained millions of dollars in damage in the Aug. 23 earthquake, including significant damage to the central tower, where finials or capstones, which are shaped like fleurs-de-lis, fell off three of the four pinnacles. 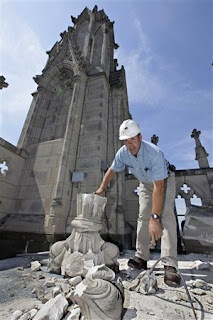 The archdiocese's donation follows the hospitality offered by Washington Hebrew Congregation to use its sanctuary for the cathedral's Sunday worship -- both Aug. 25 and Sept. 4 -- as stone masons and structural engineers implement measures to ensure safety in the cathedral nave before reopening to the public Sept. 9 for events commemorating the 10th anniversary of Sept. 11, 2001, during which President Barack Obama is scheduled to speak. "We are grateful to our neighbors of faith for their hospitality, generosity, and most importantly, their prayers, as we face the enormous challenge of restoring damaged areas of the cathedral," said Dean Samuel T. Lloyd III in the release. "This gift from the Catholic Archdiocese of Washington, a testimony to the fellowship that exists between people of different faiths, makes clear the bond we share. We are also grateful for the outpouring of support from faithful individuals across the country, who have given generously in the aftermath of the earthquake. It is a great comfort as we begin to gather financial support for this endeavor, which we expect to reach into the millions of dollars." "It was with both shock and sadness that I learned of the damage sustained by Washington National Cathedral," said Wuerl in the press release. 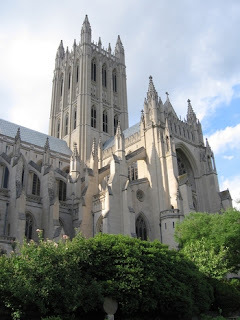 "The National Cathedral holds a special place in the hearts of all of us in Washington. So many recognize it as a national house of prayer, and indeed its magnificent Gothic towers are a reminder of our constant need to raise our hearts in prayer to God in the midst of all of our daily preoccupations." Additional hospitality has been offered by St. Alban's Episcopal Church, the parish church on the grounds of the cathedral; and the Basilica of the National Shrine of the Immaculate Conception, which hosted the dedication service of the Martin Luther King, Jr. Memorial previously scheduled at the cathedral. Updated information regarding repair efforts and reports on the extent of damages Washington National Cathedral incurred may be found at www.dcquake.nationalcathedral.org.